Tableau customers have been storing and scaling their data with Google BigQuery for years, but the unique architecture that makes it so powerful also occasionally made it challenging. Now, with the release of BigQuery for Enterprise with Standard SQL support and a host of other practical features, Tableau customers will be able to get their insights faster, more fluidly, and at even lower costs than before. The most common requests we heard from customers who were using BigQuery were for standard SQL support (as opposed to the native BQL) and ways to more easily manage the metering and usage of Google BigQuery. The Tableau and Google development teams worked together to develop a host of features that help to address both of those concerns. Support for Standard SQL in BigQuery: It's just as good as it sounds. Now, BigQuery supports your standard, SQL 2011 compliant queries. Select a billing project within Tableau: As you can see in the connection pane above, you can now select the billing project when you are connecting in Tableau. You now have the flexibility to store and query your data with whatever project you'd like. Flat-rate pricing: Instead of paying the on-demand price per TB of data processed, you can choose flat-rate pricing, allowing you the assurance of a single monthly charge, regardless of the amount of data you query. Level of Detail calculation support: Level of Detail calculations are a powerful way to control the level of aggregation in any visualization within Tableau, regardless of the default dimensions in the view. For instance, in the visualization below, we are looking at average birth weight across the US in the Google BigQuery natality sample data set, broken up into three regions. 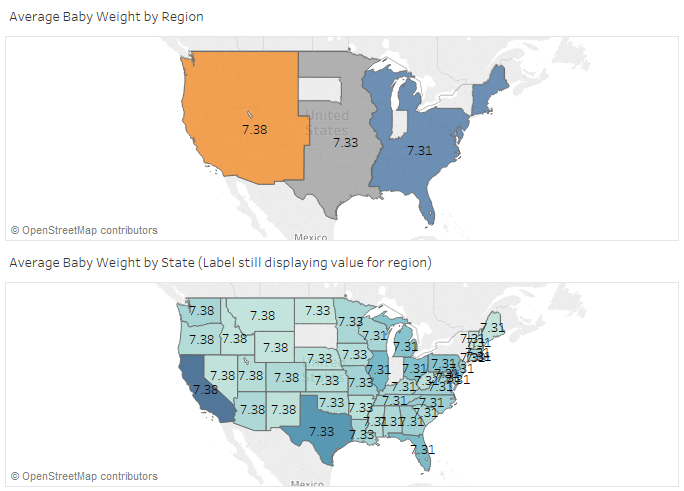 In the second image, we've shown the value for each state, but used a Level of Detail calculation to continue to aggregate the label at the regional level. If you'd like to learn more about these new features and how you can use them within Tableau, check out our on-demand webinar, Analyzing Data in Google BigQuery with Tableau or download our white paper "Google BigQuery and Tableau: Best Practices" to ensure a smooth experience combining these two powerful technologies..
How can we switch from native BQL to Standard SQL and vice versa?